Join the fun on a two-hour, story-filled stroll through the French Quarter, the oldest, most famous, and most unpredictable neighborhood in New Orleans. As the city celebrates the 300th anniversary of its founding, discover the neighborhood where it all started. This tour has history, culture, architecture, and great local recommendations for shopping and dining! The night before the tour, if you provide a phone number, your guide will send their contact information. The tour begins in the historic French Market district. We keep all of our tours small, which makes for a more comfortable, customized experience. 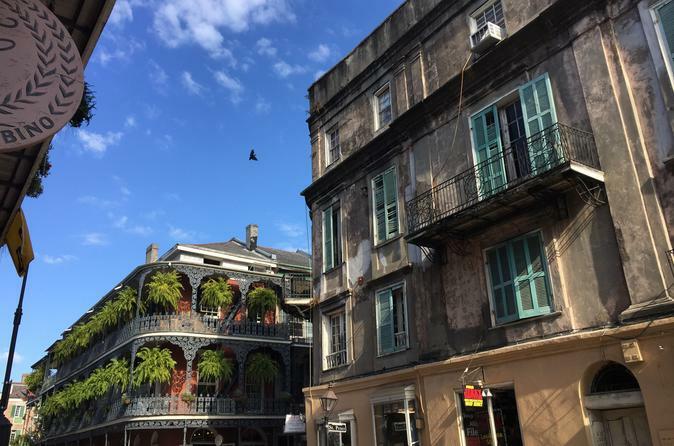 The French Quarter is where the Creole heart of New Orleans still beats! After a brief overview of New Orleans history, your guide will lead you around this vibrant, culturally exciting neighborhood and point out the locations that have made New Orleans famous - St. Louis Cathedral, Jackson Square, and the Mississippi River - and lesser-known treasures as well, such as the French Market, an almost 300 year old convent, and courtyards hidden behind the 18th and 18th Century buildings. Your guide will also be an enthusiastic storyteller, and the stories in this neighborhood are like no other! Established as a French colonial outpost in 1718, its earliest inhabitants were the quirky, gritty, fascinating types who are still attracted to it today. Every block has a story, and we are ready to share them all with you! The tour concludes at Jackson Square, but it is by no means over. Your guide is full of recommendations for enjoying the neighborhood and the city further. When you finish the French Quarter tour, you will be motivated to continue to explore this jewel of a neighborhood even further, and the knowledge you gained walking with your guide will only deepen your understanding of New Orleans and will stay with you long after you have left its quaint streets and alleys.